The Bird Xpeller Pro is available in three separate versions that are selectable within the cart checkout process. All versions are available in 110V or 220V. 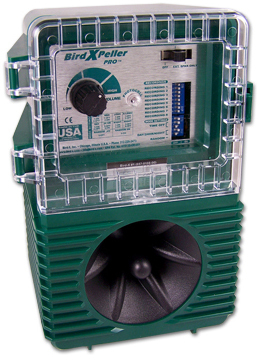 The BirdXPeller PRO is an audible bird repeller. Audible bird repellers are also referred to as sonic which means that it uses naturally recorded bird distress signals and predator calls to warn off pest birds within the effective range. Nuisance birds cause damage, liability and health hazards. It is important to note that the BirdXPeller PRO is an audible "Sonic" Bird Repeller. If you are looking for a "Ultra Sonic" or a repeller undetectable to the human ear view: >Ultra sonic bird repellers. Easy setup allows you to point the built-in speaker towards your roosting or nuisance areas to repell birds. Xpeller Pro comes in three variations listed in the tabs below. Repell pigeons, starlings, sparrows, gulls, crows, blackbirds, grackles, cormorants, ravens, and woodpeckers.